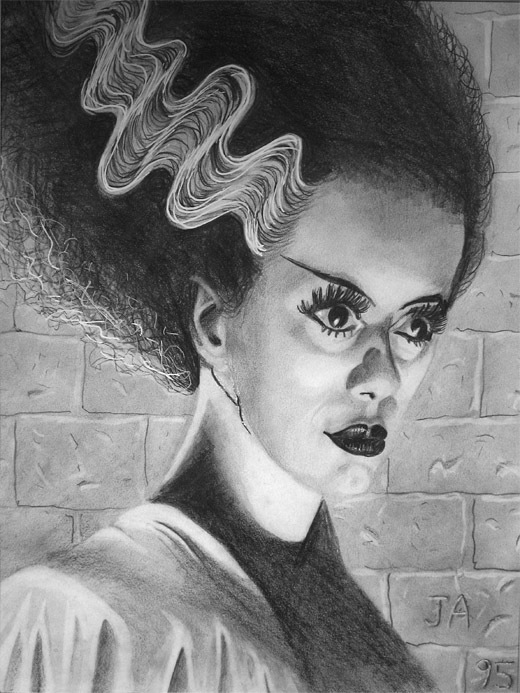 This is a landscape done for my mother during her last year with us (1987), to commemorate a trip we took to Italy together in 1983 along with my Dad, Dave, Lauren and Johnny Jr.
Pencil portrait, lovingly rendered back in 1995, of Elsa Lanchester in her role as The Bride of Frankenstein in James Whale’s 1935 cinema classic of the same name. After spending Christmas Eve and Christmas Day with Marzena’s family in Avon, Connecticut and after a sumptuous dinner we departed for home in New Jersey, a two-and-a-half hour, 150 mile trip that we had made countless times before. All such previous return trips had been uneventful, so we were far from prepared for the unexpected problems that we would encounter this time. There isn’t a more dependable vehicle than my 2002 Subaru Legacy Outback. The second name, “Outback” connotes ruggedness and reliability, and rightly so. This heavy-duty, full-time all-wheel-drive machine must be a distant cousin of the armored Bradley fighting vehicles we hear mentioned on the news that save soldiers’ lives by absorbing and deflecting roadside bombs and ambushes in the wilds of Iraq and Afghanistan. My Legacy Outback actually saved our lives years back during an unscheduled dive into a roadside ditch alongside the New Jersey Turnpike, at 60 mph, following which she climbed out of the precipitous plunge with surprising ease and nothing worse than a folded front license plate. Snow, ice, rain, puddles: do your worst! The Subaru pushes unfazed through all of them. So it was unexpected and alarming, to say the least, when about halfway through our nightfall journey home, that the battery warning light came on, accompanied inexplicably by the hand-brake warning light. Driving seemed unaffected, and the Subaru continued to respond admirably, its speed and handling hardly affected. I tried the handbrake and found that it was totally disengaged, making the warning light something of a mystery. The battery light however was something I couldn’t test from inside the vehicle. But the engine certainly had spark, and the odometer kept at a steady pace around 2000 rpm. The speed held steady at 60 mph. As we continued, I began to notice that there was a certain stiffness to the wheel and realized that my power steering was out, as well. Now I knew the source of the problem. My fan belt had quit. It was either broken, disconnected or slid off of its pulleys. Not being a mechanic, I wasn’t sure what this implied. Could the battery continue to supply spark to the cylinders? Was the heater going to quit? It was in the low 30s F. Would we be able to make it home on this cold, dark night from the middle of Connecticut? Just as Marzena was about to voice confidence that the speed and revolutions were maintaining themselves, we noticed that both the speedometer and odometer had suddenly quit. Both needles had dropped to zero. Then we became aware that the lights were dimming. The inside lights. The headlights. And I began to sense the car slowing down despite my giving it gas. We pulled on to the shoulder but kept going, planning to take the next exit. The loud buzz one gets when driving on those corrugated pavement strips that are intended to wake a sleeping driver became unnerving, but we plowed on. We plowed on until two sudden, startling jolts were felt that all but halted the car. They passed, and the Subaru kept driving on the shoulder. The lights were out. The engine was losing power, but she continued onward for another mile until we reached an exit ramp in the middle of nowhere. Unfortunately the ramp made a 270-degree turn leading us on to an unlit, winding road to nowhere. We paused to make a K-turn, all the while fearful that the engine might stall and knowing we didn’t have battery power to start up again. I gunned the engine in neutral between gear shifts to prevent a stall at the very low rpm we were experiencing and made a K-turn back toward the ramp, this time hoping to drive the limping vehicle toward some form of help. Ahead and to our left, a gas station came into view at the far end of an alternate ramp that we should have taken in the first place. Marzena pointed out that although the attached convenience store was open, the service garage was closed and dark. Still, having no place better to go, we headed there. I pulled the Subaru alongside the building and left the failing, battery-less engine running, got out and entered the convenience store. Manning the cash register from inside an enclosed cubicle was a smiling, middle-eastern man radiating warmth and hospitality. “You don’t have a mechanic on duty, do you?” I asked, knowing perfectly well that he didn’t. “No, sorry,” came his reply. “You picked the wrong day,” he continued apologetically. “I know!Christmas!” I lamented, as he shook his head in sympathy. “No,” he had to admit. That last question caught the attention of a tall trucker wearing a dark flight jacket who had just paid for a cup of coffee and a cellophane-packaged pound cake. “Why? What seems to be the trouble?” the trucker asked. I guess I looked worried and agitated, because he went on to say, “Don’t panic. Don’t get nervous. A lot of things can be solved if you stay calm and don’t get anxious.” He proceeded to step outside the store along with me, and he put his coffee and pound cake down on a stack of cardboard cartons piled next to the doorway. “Is it still running? 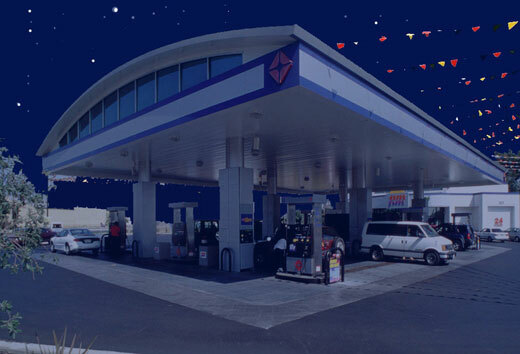 Can you pull it up here under the lights?” he asked, to which I responded affirmatively and immediately drove up under the lit overhang arching from the store out over the gas pumps. I was therefore blocking the first set of pumps, i.e. those adjacent to the storefront. “Pop the hood,” he said, and I did. The trucker, whose name we hadn’t yet learned, took a quick look, then stepped away momentarily. When he returned, he was in the process of opening a portable chest of tools. 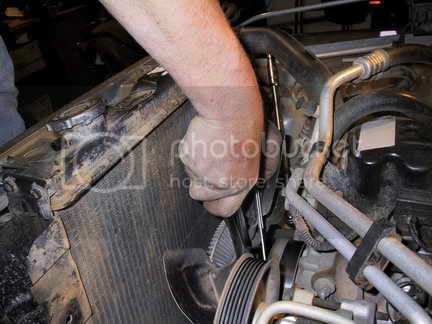 Within minutes, he had removed the cover off the engine and was inspecting the partially shredded and dislocated fan belt. I guess he was hoping that he could just remount the belt on to the various wheels and pulleys around which it was supposed to go. We shared his disappointment when he pointed out that not only was the belt shredded, but one of the pulleys, a wheel about 5 inches in diameter, was cocked at an ugly angle, dangling loosely from the axel on which it was supposed to be mounted. He soon disconnected it and delivered it out so we could inspect it. “See, it’s all messed up,” he stated pointing to the inner ring of the wheel which was disrupted and loose from the main body of the wheel. I could see the series of ball bearings all crushed, flattened like lentils rather than spherical in shape. Some, in fact, fell loosely out of the wheel and to the ground. It spelled disaster. “A fan belt,” he explained, “is a fairly common replacement part. But this here pulley-wheel”, well, where are we going to get one of them tonight?” Nowhere, I thought. “Don’t you worry! He gonna take care everything!” said the undaunted convenience store clerk in his Arabic accent. Apparently, the clerk had a completely unrealistic idea about the mysterious trucker’s abilities to materialize a Subaru engine part on a dark, cold Christmas night in the middle of rural Connecticut. He looked hopefully, still smiling, at the trucker who didn’t react. “Where do you people have to go?” the trucker asked. “Oh, boy. That’s problem!” The clerk responded. “Can’t you do something, help this pretty poor lady get back home tonight? Don’t worry. He gonna help you get home.” We weren’t buying it. “Can I have a look inside the service garage?” the trucker asked the clerk. The trucker and I walked back and through the convenience store into the cavernous, unlit garage. “Can you turn on a light?” he asked. “How about a flashlight, then?” the trucker asked. “Sure thing!” the clerk replied and he ran off briefly and returned with his own personal, rarely used, partly disassembled flashlight, the kind with flashing amber and red side light for roadside repairs. He was unable to piece it back together, but the trucker had relatively little trouble doing so. Once he did, the results were disheartening. The service area was practically empty, the walls bare and devoid of everything but empty shelves. “Yeah, the boss, he’s retiring,” the clerk informed us. “He don’t do much repairs, just change oil and oil filters now. You want to try to use his tool? 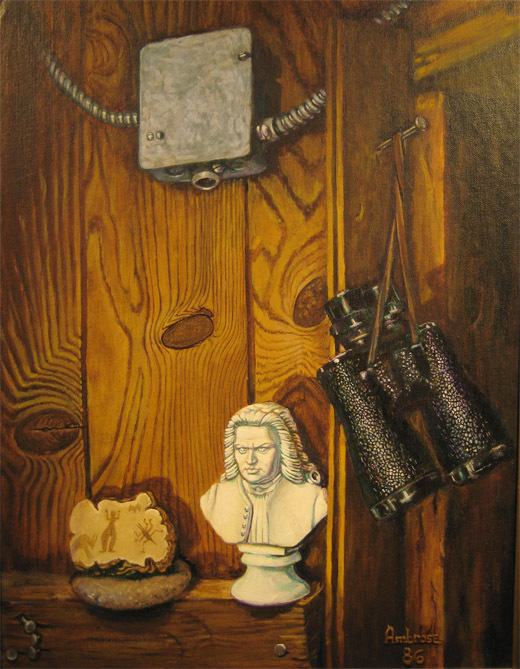 You can use any tools,” he added pointing to one of those red metal chests on wheels with many flat drawers. Of course they were all locked. Anyhow, who needed tools? There were no parts. Our expedition into the garage was about to end when I spotted an unbelievable sight. There on a shelf stood a stack of not one, not two, but three wheels looking very much like the broken pulley wheel we still held in hand. They were blackened, covered in rust, soot and grease— black with age. Cobwebs formed a dusty veil stretching from the stack to the shelf on which it rested. Wordlessly I pointed, and the trucker reached out to them and grabbed the first one. “No, doesn’t fit,” he commented, comparing it with the broken one in my hand. He looked at the next one. It had a grooved outer surface, whereas mine was smooth. But it was the same size! “This’ll do,” he said with satisfaction. He fiddled with it as we left the darkened service area. I wasn’t sure what he was doing, but he appeared confident as he approached the Subaru sitting out in front of the convenience store doorway. He leaned under the hood and, with a few twists of a ratchet, installed the new pulley wheel where the damaged one had been. “I don’t know,” replied the convenience store clerk.”It’s Christmas. Maybe not going to be open anything.” I figured he was probably right, but I didn’t want to discourage the truck driver if he was planning to go looking for a fan belt for us. “Bekins” moving van, of the sort that transport whole corporation across country. We nodded agreement, still dumbfounded by his magnanimous offer, and off he went to the truck with our shredded fan belt in hand. 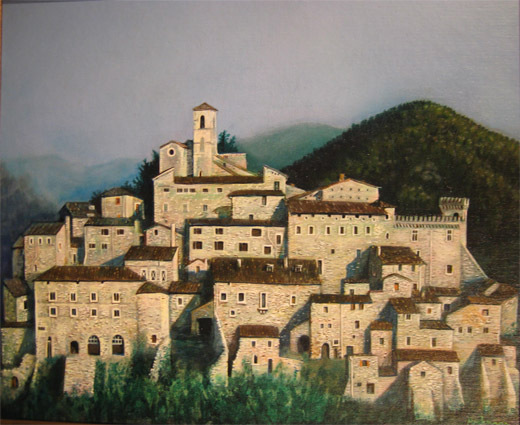 We spent the next hour and a half standing in the convenience store chatting with our host, the clerk, who offered us coffee, hot chocolate and “cappuccino,” often expressing sympathy for our predicament. We watched amusedly while he interacted congenially with clientele, sold lottery tickets, and repeatedly offered to call Triple A, a taxi or a tow-truck if we should wish. Once he learned that we were doctors, he turned serious and begged our indulgence while he asked for advice regarding the medical problem, to him an unbearable tragedy, of his life. It seems that a motor vehicle accident had left him with a smashed, flattened nose, a condition not at all evident at this time, the reason being that he had undergone a remarkable surgical reconstruction in his native Egypt. According to his account, a specialist in Cairo had inserted a graft, custom-fashioned from coral, and sterilized to serve as a nasal bone substitute. We were, needless to say, enormously impressed. True, it had cost him several thousands of dollars, a major financial burden to this married man of modest means and without insurance benefits. Nevertheless one could not but admire the cosmetic success evident to our very eyes. What, then, was his insurmountable problem, we wondered? Our cashier friend, still without insurance and fully aware that major plastic reconstructive surgery in the United States would cost a fortune, was dissatisfied, not because of any problem with his breathing nor the appearance of his nose. But rather he could detect the slightest hardness on either side of the nasal “bone” which he invited me to confirm by touching the area myself. As a life-long physician and a student of human bony anatomy, I couldn’t detect the least abnormality or enlargement or hardness in my examination of his face and specifically his nose, and I told him so. Realizing we were unimpressed, he went on to elaborate further, that on those rare occasions when tossing in bed caused a collision between his nose and his wife’s elbow, well, then, he experienced “a lot—a real lot” of pain. Incredulous, we tried to reassure him that everybody experiences pain in that circumstance, and what of it? Yes, that was exactly what his wife had told him, he recounted. Namely, that he was lucky to have had a very successful and near-perfect operation that had restored the cosmetic appearance of his nose, and had left it perfectly functional. We added our chorus of agreement, and urged him to set aside his concerns in the interest of reality and sanity, to abandon plans to ruin himself and his family financially for some unspecified and unattainable â”correction” or “improvement” in his situation. I hope we succeeded. He promptly picked up his cell phone, called the wife at home and admitted to her that she had been right all along. Two doctors had just agreed with her that he shouldn’t try to look for another operation. In due course, the truck driver returned this time driving an SUV, but the only item he held in his hand was the old, tattered fan belt. Nothing was open. No store, no service station. This trucker’s altruism and Pacino’s hospitality had exhausted the quota of miracles and good Samaritans that this region of Connecticut had in its inventory. What was next? “Don’t panic. Don’t get nervous,” repeated the trucker. “The only time you can’t solve things is when you get too nervous,” he added. I detected a slight, very slight, accent, but I couldn’t place it. Coincidentally, he was curious about us. “And where’s your accent from?” he asked Marzena. “Polish,” she stated. “I’m Polish. What’s your name,” she asked him. 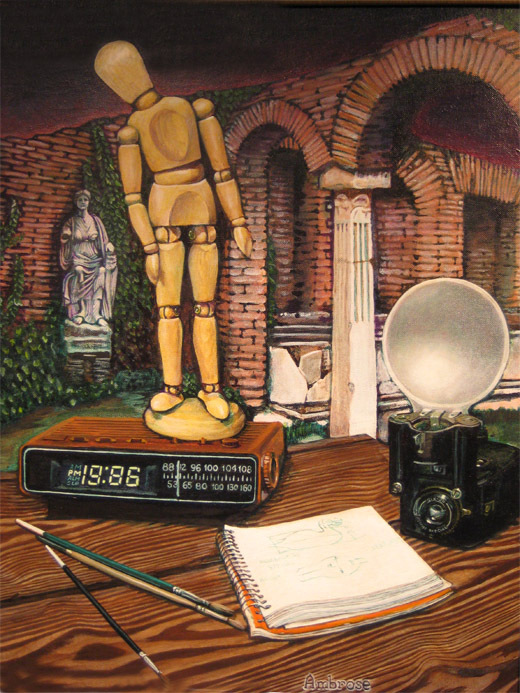 “Ivan,” he replied. Tall, with a fair complexion, and named Ivan. Naturally Marzena asked the logical confirmatory question. “Are you Russian?” she asked. “Egyptian,” he answered. Blinking, but willing to believe anything, we shook our heads, looked at each other and said, “Okaaaaay,” and wondered if we would ever trust our ability to assess anybody’s ethnic identity in the future. Well, the fan belt was tattered, but when you looked at it, it was in continuity. It was still a belt, albeit with long hanging strands dangling from it. It had looked worse when we first discovered it partially shredded and hanging off its pulleys. But now, looking at it again, in the light of having no other belt available, Ivan wondered if he couldn’t trim off the dangling strands and be left with a serviceable —granted, skinny— remnant of a belt that might serve to operate the wheels it was intended to encircle. He returned from his truck with a box-cutter and proceeded to trim what he had to, but leaving about half the thickness of the belt intact. Then came the tedious and frustrating process of looping the belt-remnant over the various wheels and pulleys just right to make them turn the right way and to apply just the right tension to the belt. Our cashier friend held the flashlight down into the engine and all our hands froze as the trucker repeatedly skinned his knuckles trying first this configuration, then that, in order to achieve the correct placement of the belt. Customers begged Pacino to unlock the restroom doors, but he was busy, he explained, holding a flashlight for Ivan. Finally, it was accomplished. “Turn her over,” he suggested and I leaped behind the driver’s seat. A turn of the key produced no response at all. Not a sound. The battery was dead. Our truck driver quickly ran to his SUV and popped the hood, pro,ptly setting a pair of jumper cables into place running between the batteries of the two vehicles. “Now try it,” he said, and sure enough the belt went right into place as the engine turned. In no time our beloved Legacy was fully operational. We disconnected the cables, and left her running, as we returned to the convenience store in order to negotiate a way of expressing our deepest gratitude to these two heroes, Ivan and Pacino, knights in shining armor, angels of mercy, whatever you want to call them. Ivan estimated that the pulley wheel might have been $45 new. I gave Pacino $45 to pass to his boss, the service station owner, and another $15 to keep for himself. He had, after all hosted us in the most generous, kind and hospitable way for almost two hours! Ivan wouldn’t hear anything about a reward or reimbursement. He blocked Marzena from using the ATM machine to get cash. He didn’t agree, and kept at us to acknowledge that he was only acting on behalf of God’s plan. The improbability of the encounter, the coincidence of our arrival at the service station simultaneously with him, the unlikelihood of otherwise getting help this Christmas night all convinced him he was right. Furthermore, it seemed to fit into his middle-eastern concept of Fate. While this philosophical issue was being discussed, I surreptitiously folded two $20 bills and a $5 bill inside another $5, so that they were hidden, and it appeared that there was only a single bill in my hand. Still Ivan backed away, until Marzena announced that it was just the cost of a cup of coffee that we were offering. I slipped it into his jacket pocket over his protests, and repeated our thanks as we took our leave and boarded the Legacy for the trip home. “Let me have your business card,” I asked him. “I’ll put it up on my website!” And here it is! Anybody considering a move, GO TO his website. And now I ask: Would two Christians have done so much for us on this Christmas Day?